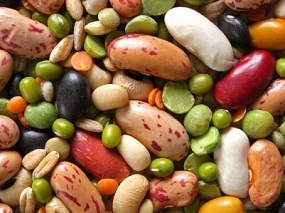 Really, it’s 2015 and we’re STILL talking about protein-combining for plant-based diet? Animal-based sources (meat, eggs, dairy) pack them all in one amount or another, but most plant-based sources only contain a fraction of the nine essential amino acids, meaning that if you get all your plant-based protein from peas, you could end up not getting enough of certain amino acids, explains study co-author Rajavel Elango, a nutrition and metabolism researcher with the University of British Columbia’s School of Population and Public Health. When getting protein from plant-based sources, it’s important to munch on various protein-rich plants at every meal to help guarantee you get all of the amino acids you need by day’s end. Back in the day, and by “the day” I mean the seventies, Diet for a Small Planet perpetuated the idea that you had to combine protein at every single meal in order to get “complete protein.” So if you were going to eat beans, you also had to eat rice. If you were going to eat lentils, you had to add some grains. But the idea that plant proteins are incomplete and not likely to deliver all of the essential amino acids has not just been contested over the years, it’s been debunked. The idea that all essential amino acids must be eaten together at each meal isn’t true like we used to think. One can eat a variety of foods that are rich in essential and non-essential amino acids, and completely get their fill of protein. Many plant-based foods are filled with all essential amino acids (hemp, chia, sprouted brown rice, and spirulina, just to name a handful). What I love about this list is that 4/9 of the best sources are totally vegan. And, whereas the first thing that comes to most people minds when they talk about protein is steak or burgers, these are nowhere to be found on this list. So that’s progress. If you’re still a little antsy and unsure about getting enough protein on a plant-based diet, just figure up how much you need. Multiply your body weight times .40 and that’s the recommended amount of protein you need for everyday functions. If you’re athletic, eat a little more and divide it up evenly between meals – simple as that. I’ve heard people say that if you’re an athlete you should be thinking about 1 gram of protein per pound of body weight every day. I find that impossible. And that would mean a heck of a lot of green peas, for sure. But no one is going to eat only green peas. Sure, athletes need more protein than non-athletes. But we also need more carbohydrates and fat—our overall caloric needs are much higher since we burn so much energy in our training. So because we’re eating more calories, we’re automatically consuming more protein if we stay at 10-15 percent of the total. For example: I’m about 80 kilograms and I need 2500 calories most days. If I want ten percent of those calories to be from protein, then I need about 63 grams of protein. When I’m Ironman training or have an otherwise heavy load, my caloric needs double. Therefore, so does my protein, to 126 grams. I tell the vegan athletes I consult to shoot for 1.0 to 1.2 grams of protein per kilogram body weight. You can see from my numbers above that even when protein is only ten percent of calories, I’m getting 1.5 grams per kilogram body weight. Contrary to what most people believe, more isn’t necessarily better when it comes to protein. The body can only process so much per day, and any additional protein is inefficiently converted to energy or even stored as body fat. His formula is a lot less than the gram per pound formula. A kilogram is 2.2 pounds. So if you need 1 gram per kilogram, then that’s starting to sound more reasonable. So here’s the thing: you can be on a vegan diet and get enough protein without having to torture yourself over food-combining at every meal. Just eat a variety of foods and — presto — it will all work out in the end. And just a quick reminder. I know most of the people who read this blog regularly aren’t big dieters who are bent on losing weight, but it bears repeating that vegan is not a weight loss diet. It’s a great way to eat, but it’s not a ticket to weight loss. For more on vegans and protein, see “Vegans and Protein: Yes we like it too” and How to Get Lots of Vegan Protein. This is an excellent post! Thank you for spreading the news about practical protein intake. I’m not a vegan, mostly because I don’t eat sprouts, beans, legumes and such. But I do find it interesting that no one even cares about how or what you eat until you tell them you are a vegan.Then all of a sudden its this long discussion on the many ways to get protein. This developed as info shared by (male) bodybuilders among themselves. So: conceived as a rule of thumb for people looking to pack on lean mass and who are genetically set up to build more bulk in the first place. Reblogged this on Clean 9 Detox Healthy Diet. Super-informative post! And it’s nice to get the reminder that variation in a plant-based diet will give us what we need, without having to focus on documenting, weighing and measuring (which is mostly untenable). I get asked all the time where I get my protein. When you think of it, apes and other primates are animals that are most similar to humans. What do they eat? Plants. They are also known to be the most powerful mammals. It just makes sense plants would give us enough protein. Also, plants are living organisms meaning they need protein to survive. So again, obviously they have protein. But there are plants that have complete proteins too like quinoa, chia seeds and nutritional yeast, right? I love this post! I’m mostly vegan and yeah, that 1g protein per pound of bodyweight would never happen for me unless my hunger doubled. I think I do usually eat beans with rice or another grain, but that’s just because that’s how I like them. The kind of squishy texture of beans needs something to balance with.